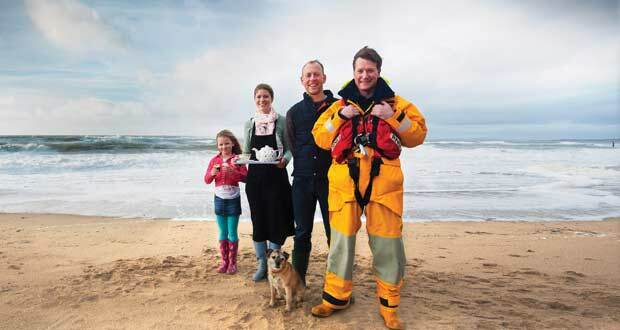 Pictured with Lough Ree RNLI crew member Stan Bradbury are from left, Evie Hodges, Naomi Pickard and Ben Jordan. 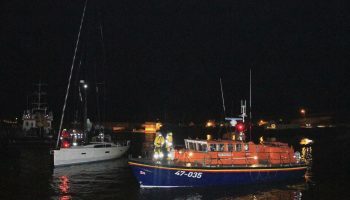 The RNLI is issuing its own call for help, appealing for volunteers to help with ‘Mayday’ – the charity’s forthcoming national fundraising event in Ireland – which will be taking place from 1–5 May this year. The charity is calling on people to show their support by volunteering to help with street collections and a range of other fundraising events, which will be taking place across Ireland during the five days. The charity is asking if people can give just a couple of hours of their time – maybe to get involved with a street collection or to help run an event. 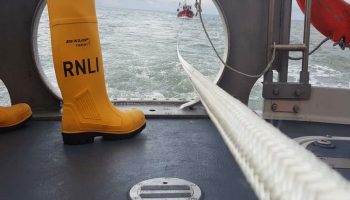 Events will have a ‘welly’ theme, in a nod to the iconic yellow wellies – an essential piece of kit – worn by the charity’s volunteer lifeboat crew members. Welly walks and ‘Wear your wellies to work’ are just two examples. Last year, RNLI lifeboat crews from Ireland’s 44 lifeboat stations launched 1,087 times, rescuing 1,278 people. They are on-call 24/7, every day of the year, ready to respond to emergencies at sea. ‘The RNLI’s dedicated volunteer lifeboat crews around Ireland are always ready to respond to the Mayday calls of those in distress at sea. We’re now hoping people will respond to our call for help, by volunteering a bit of their time to help run some of the great events we have planned for the five days spanning the Mayday bank holiday weekend. All money raised through Mayday fundraising events in Ireland will support the RNLI’s work in Ireland – it will be used to fund crew training, buy new crew kit, or contribute towards the running costs of a lifeboat station. Stan Bradbury, Lough Ree RNLI crew member, pictured, said: ‘Thanks to the money raised through campaigns such as Mayday, the RNLI’s volunteer crew can continue to train so we are highly skilled and efficient to carry out our lifesaving work. There are many ways to get involved with Mayday and no matter how small, your generosity will help’. Anyone interested in getting involved can see what is going on in their area and sign up to volunteer at www.rnli.org/Mayday or call 01 895 1837.